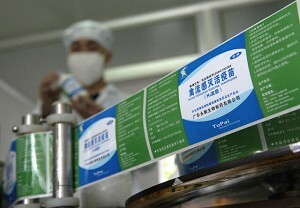 TAIPEI – Wenweipo, a newspaper in Hong Kong, confirmed with experts from China’s Ministry of Agriculture and the Veterinary Institute in Harbin that the use of fake vaccines has caused the bird flu to get out of hand in China’s Heishan County, Liaoning Province. Eighty percent of the poultry in Heishan County were reportedly injected with false vaccines. The birds that were given false vaccines lack antibody that would resist the infliction of bird flu, experts said. A specialist from the Veterinary Institute in Harbin, the sole bird flu-testing agency designated by Beijing, said that bird flu is a disease commonly seen among birds of all sorts. It has been in existence for over one hundred years and often occurs to unattended migratory wild birds. It spreads fast among birds through air and is hard to contain once breaking out. The bird flu virus has a long incubation period, usually six months, within the bodies of migratory birds, especially water birds. But poultry, chickens in particular, would die within hours after contracting the disease and pass it on at an alarming speed. Usually within hours, a virus-afflicted chicken would spread the flu through air to other chickens nearby that have not been vaccinated, resulting in mass poultry deaths. The expert warned that since we are well in fall and winter is approaching–a high season for bird migration–bird flu is most likely to break out. The only way to guard against poultry catching bird flu is for them to get vaccine shots. He revealed further that according to an official investigation, over 80 percent of the poultry in Heishan County, Liaoning Province were injected with fake vaccines, which is the cause for the local widespread of bird flu. The fakes had caught the poultry farmers and the agency for disease control totally unprepared, and let the best opportunity to prevent the outbreak of bird flu slip by.